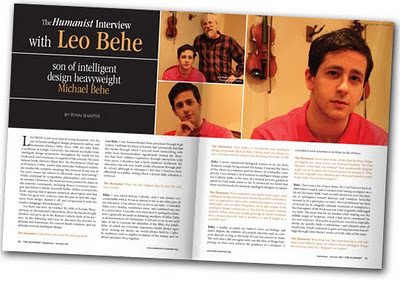 I hadn't seen before that Leo Behe gave an interview last year. As for the arguments from design, such as irreducible complexity or the so-called fine-tuning of the six cosmological constants, I have many reasons for dismissing them each in particular, but one overarching reason would be the common refutation of William Paley’s classic watchmaker argument—the only reason that complex objects appear to be designed is because we as humans create complex objects, and we then assume that complexity is indisputably indicative of a designer. This is an association we make only as a result of what our “common sense” tells us. A much too much unappreciated fact. I would like everyone to realize that he doesn’t have any sort of religious agenda and he’s not trying to denigrate science in any way. Long-held beliefs, especially beliefs developed during childhood, operate on a very deep and basic level of thought—almost subconsciously. These beliefs can exist independently in a perfectly honest and intelligent scientist who is simply doing his part to further theories or ideas that he believes are supported by the scientific data. The best way to progress is through respectful and thoughtful discussion and debate, as it has always been. I wish this to be true. I've met Michael Behe briefly at a conference, and I would like to believe that his mind is merely clouded by his religious thinking (and I hasten to say, in much the same way that most of us are clouded in our thinking in some ways or other - to me, one of the greatest joys* in life is to discover my own delusions). Seems to me that what he's doing here is confuse the evolution of the whole system consisting of bacteria and virus (which from the outside does end up with the same dynamics of infection), but ignores the really interesting thing that goes on in the virus in response to the changes in its host (the bacterium). First, what a shame that he can't appreciate the evolutionary processes that took place in these experiments. If this is not a blatant example of inability to break free of dogma, then something else is. Second, I have always had a problem understanding proponents of Intelligent Design, because they seem to at some level agree that evolution does occur, and yet they have problems with research that shows how new things are made. This is the domain of the "designer", apparently. But then, why not just say that that's what he did? ID proponents still - as far as I am aware - haven't described how evolutionary events such as viruses evolving new ways to attack the bacteria look different from when they happen naturally. In other words, there's no way of distinguishing the two ways (which would be a great step forward for the "debate" if someone would take this question seriously), so why don't the ID proponents just say that this is the way the designer does it in the first place? I mean, instead of this yapping about whether some research is profound or not. * Along singing, dancing, playing, drinking, thinking, eating, winning, losing, procreating, baking, kissing, camping, biking, skiing, and writing in dew.